I refer to WordPress.com’s front-end dashboards at different times. This short item is simply to explain that WordPress.com has two different front-ends. 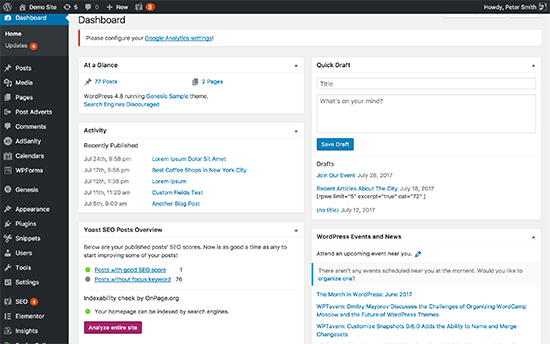 The original front-end to WordPress is invoked through the wp-admin dashboard. This is still the case for WordPress.org users and for older WordPress. com users. Here is an example .. In 2015 Automattic, the owners of WordPress.com, introduced an alternative front-end, called Calypso. They will try to persuade you to use it rather than the wp-admin dashboard. They say that it is faster. I must admit that I have not found it so, and it is also missing some of the features that can be found on the wp-admin dashboard. Anyway, it is there and some of you may be using it. Here is an example of the Calypso dashboard .. Some users may find that there is an option on the Calypso dashboard (probably at the bottom) to switch to the wp-admin dashboard if you should wish to do this. An alternative method, if this option is not shown, is to change the url by typing wp-admin after the domain name.